The borders of fiction and reality are slipping ever further. A lot of what is behind the images on our screens remains hidden: their political utility; the algorithms through which they appear; the source of their magic. How does that change the nature of the exhibition? Is it moving from the white cube into virtual realms, into the urban fabric, into domestic spaces? Between networks, theory and the market, where is the power of exhibitions today? In this issue’s round-table discussion, the Volksbühne’s designated director Chris Dercon, and curators Heidi Ballet and Tirdad Zolghadr talk about the power of the object, the large-scale exhibition, lazy curators and the importance of creating a public. The architect and writer Alessandro Bava takes a different approach to the issue’s theme in an essay that moves from the rediscovered relevance of architecture and the desire for real experience to what this means for the future of art spaces. Valentinas Klimašauskas addresses what he calls “cube fatigue” to ask if exhibitions are now happening on our phone screens. Ben Vickers walks us through the past and future of virtual reality and the challenges it poses to customary ideas of what art can do, while Rob Horning looks at the flipside of new technologies in an essay that explains the temptation of turning to the panoramic sky in the New York Times Virtual Reality app. Meanwhile, Barry Schwabsky grapples with the enigma he finds in the work of painter and installation artist Karen Kilimnik. Other highlights include Maximilian Geymüller‘s interview with Brigitte Kowanz, who is representing Austria at the Venice Biennale, and artist and producer Asad Raza in conversation with Brussels-based choreographer Andros Zins-Browne about what it means to stage “de-hearsals” in the space of the museum. Shortly before moving her live-and-work studio into the Giardini in Venice, Dawn Kasper told us about five artworks that give her “the drive to want to continue to learn and create.” In the “Curator’s Key,” M+ chief curator Doryun Chong tells us about Martin Wong‘s Stanton Near Forsyth Street (1984) and its evocation of a bygone New York. For the “One Work” column, Harry Burke writes about the links between language, performance, indigeneity and ecology in Cecilia Vicuña‘s cloud net (1998–99). And in “Exhibition Histories,” Liam Gillick remembers coming up against the limits of art when he entered 303 Gallery in New York in 1992 and found Rirkrit Tiravanija cooking food and giving it away for free. Emeka Okereke writes a postcard from Lagos, a city whose flourishing art world nevertheless mirrors geographical and historical divisions. Nora Khan writes on the promise and the shortcomings of rave as a form of total immersion. And Dan Bodan writes our last-page column with a diary of encounters in Kiev, Athens and Paris. In this issue’s “Views,” Alexander Scrimgeour tries to get to the bottom of the problem that is the Athens instalment of Documenta, while Iona Whittaker writes on Carol Rama‘s retrospective at the New Museum in New York, plus critics take on shows in Vienna, Graz, Berlin, Paris, Zurich, Basel, Brussels, New York, Los Angeles. The full list is available on the online contents page, here. Plus a poster by Karen Kilimnik, which will also be available soon as an artist’s edition. Have a good summer! 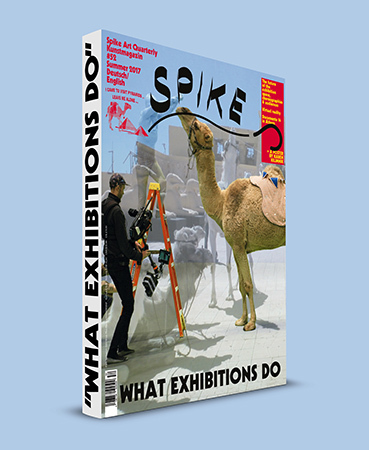 The next issue of Spike will be out on October 4.